Dhol Baaje - MSG The Warrior Lion Heart - Saint Dr. Gurmeet Ram Rahim Singh Ji Insan (2016) Watch HD Bollywood Hindi Song, Read Review, View Lyrics and Music Video Ratings. Presenting Dhol Baaje sung by Saint Dr. Gurmeet Ram Rahim Singh Ji Insan. Cast: "SAINT DR. GURMEET RAM RAHIM SINGH JI INSAN, HONEYPREET INSAN, CHARANPREET INSAN, KAINAAT INSAN, GARIMA INSAN, RAJESH INSAN, SUKHOTTAM INSAN, ASHOK INSAN, BHUSHAN INSAN. Banner: Hakikat Entertainment Pvt. Ltd.
Saint Dr. Gurmeet Ram Rahim Singh Ji Insan & Honeypreet Insan"
Click here for latest posts regarding Gurmeet Ram Rahim. 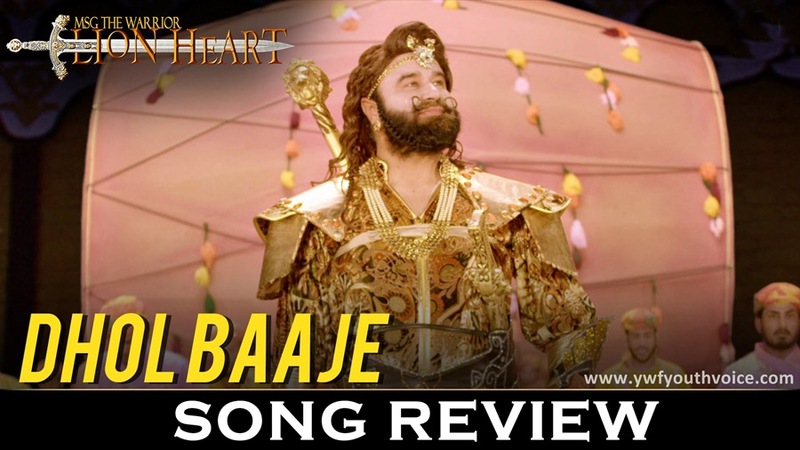 Song is full of energy, totally deserves to be the title song of movie named "Lionheart". Rockstar Saint is really good with this genre of music. Click here to watch trailer of MSG The Warrior Lionheart. Click here for all songs of MSG The Warrior Lionheart. Jo zaalimo ko patjhad bna de..